This book makes me laugh out loud — and then I can’t resist reading the whole thing aloud in a dramatic voice. 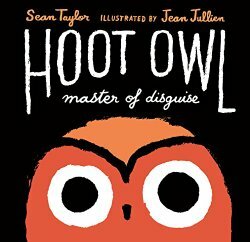 I think I will be booktalking this book with the younger elementary school grades this year. It uses simple sentences and is easy to read, and is brilliantly funny. The darkness of midnight is all around me. But I fly through it as quick as a shooting star. And look there . . .
a tasty rabbit for me to eat. Soon my sharp beak will be gobbling that rabbit up! Everyone knows that owls are wise. I disguise myself as . . .
With the rabbit, he disguises himself as a carrot. With the sheep, he disguises himself as a mother sheep, with the pigeon, he disguises himself as an ornamental birdbath, and with the pizza, he disguises himself as a waiter. Which one of those disguises do you think works? With which one of those disguises do you think the prey does not go away? and two of them are mine. How can I resist reading this aloud? This entry was posted on Tuesday, March 17th, 2015 at 10:29 pm and is filed under Animal Characters, Delightfully Silly, Picture Book Review, Readalouds, Starred Review. You can follow any responses to this entry through the RSS 2.0 feed. You can leave a response, or trackback from your own site.